Fermez les yeux un instant et imaginez ceci… Après une longue journée de détente au soleil, sortez sur votre lanai et la douce brise de l'océan touche doucement votre visage lorsque le soleil rouge doré s'enfonce dans la baie. Vous pouvez entendre les vagues se briser sur la plage alors que vous profitez d'une autre journée parfaite sous le signe du luxe à la Villa La Estancia - Votre chez-soi au bord de la mer! Venez séjourner chez nous au bord de la mer dans notre villa de 2 000 m² (1406 A / B), décorée sur mesure, située au 4ème étage avec vue sur l'océan, la piscine et la montagne. Profitez du centre de remise en forme entièrement équipé avec sauna et hammam ou offrez-vous un massage ou un soin du visage dans notre spa de classe mondiale. Vous pourrez vous détendre près de la piscine à débordement multi-niveaux adaptée aux enfants avec un bar à entrée zéro et dans la piscine ou vous diriger vers la plage de sable doré et prendre un bain rafraîchissant dans les eaux de la baie de Banderas. Vous pouvez également vous détendre dans l'un des 4 bains à remous face à l'océan. Continuez à vous détendre en sachant qu'il existe des services médicaux et de sécurité 24h / 24 avec un médecin parlant anglais sur place. La ville balnéaire voisine de Bucerias, avec ses boutiques et ses restaurants authentiques, n'est qu'à quelques minutes à pied de la plage. The condo was spacious and clean. Great view of Ocean and pool area. The resort amenities met my expectations. A few issues that need to be addressed. There was no reserve toilet paper or paper towels and the AC didn't work very well in the bed rooms. If I was told that I should bring a roll or two in my suitcase I would have happily. I did enjoy my stay and would recommend it, just let the guests know more what to expect and what they might want to bring. This was our first time in this area of Mexico and staying at Villa La Estancia and it did not disappoint. In fact, we are already thinking of planning a return trip and I am not one to typically go to the same vacation destination twice. This villa was the perfect place for our family of five including my husband, twin 12-year-old girls and a 9-year-old boy. After being greeted with a glass of champagne and hand massages, I knew we picked a gem! Our condo was so spacious with huge master bedroom, modern kitchen, bar with stools which was perfect for breakfast, a dining area and great room area. The washer and dryer came in handy too. There are sliding glass doors off both bedrooms and the main living area that lead to a huge terrace that overlooks a beautifully landscaped pool and provides a view of the ocean (perfect for a glass of wine as the sun is setting!). The beds were really comfortable and it was really nice to have the third bathroom and shower. The kitchen was well stocked although I was surprised that there wasn't pepper and more spices. Not a big deal though. We made a couple of trips to the Mega grocery store about a 5 minute taxi ride away. A grill would have been nice to have on the terrace since we ate dinners in most nights, but fortunately our friends had a condo on the same floor not far from ours that did have one so we were able to gather at their place and grill. Ryan was very responsive, easy to work with and accommodating when we had to make a last minute change. 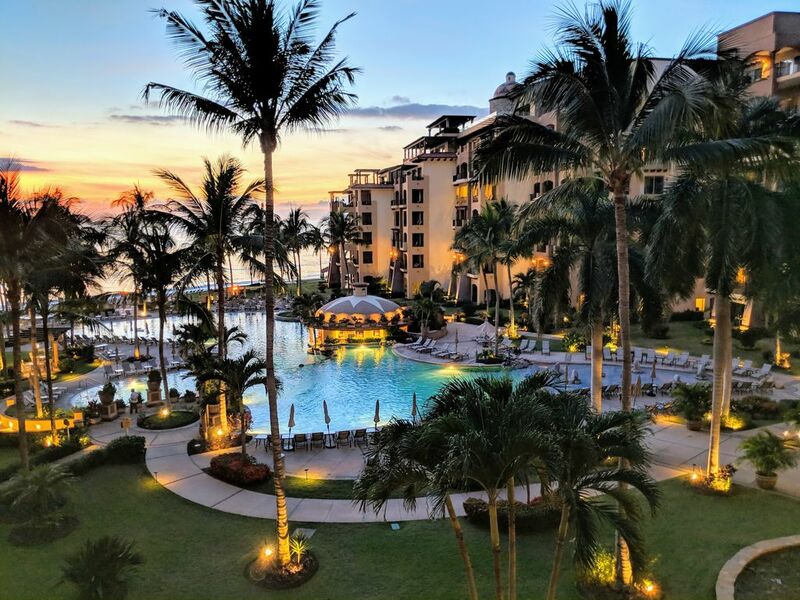 Overall we absolutely loved Villa La Estancia and the attentive staff, location, beach, pool area and hot tubs added to the whole experience. They also had three boogie boards in the unit which our kids used constantly. The water was pretty warm and had the perfect waves for boogie boarding even for the younger kids. I also loved that we were able to walk along the beach for miles and could get to Bucerias (definitely check it out!) in about 20-25 minutes. Only wish we could have stayed longer. I would recommend Ryan's condo in a heartbeat and would definitely stay there again if we go back. My kids said it was one of their favorite vacations ever! Thanks for the detailed review Suzanne, so happy your family enjoyed your stay!